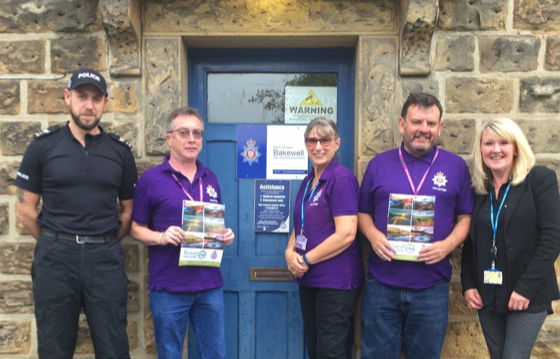 Derbyshire Rural Crime team have begun crime prevention visits on farms in the Derbyshire Dales area. There are estimated to be 2000 working farms, which rarely have been visited by police in the last ten years, unless to the report of a crime and even then it’s not a guarantee an officer will have attended. We no longer as a force have Crime Prevention Officers so the visits are arranged by an office based Crime Prevention Volunteer in advance and are carried out by two retired gentlemen, who live locally, and who want to give back to the rural community. On the appointment, a tour of the farm buildings are made, insecurities pointed out and best practice shared. Farmers are signed up to our new Derbyshire Alert system, where they are registered as a farm and set up to follow us on social media. A selection of signs are taken out on the visit, along with examples of the latest crime prevention equipment. Details of assets on the farm such as solar, caravan storage and electric fencing are listed, so that follow up crime prevention advice can be given should spates in that type of crime occur. The Police Support Volunteers feedback to a database each week, and each visit if followed up with an email of relevant sign posting to other support agencies.